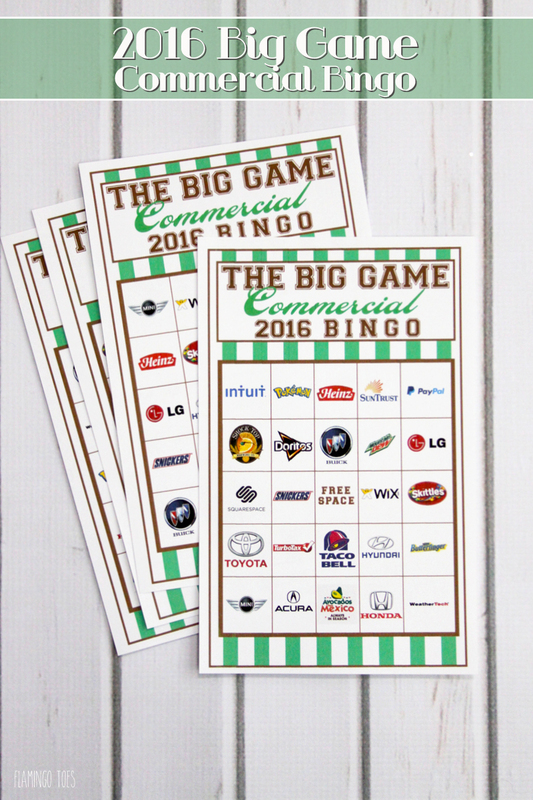 Click Here for the 2019 Commercial Bingo Cards! It’s almost time for the Big Game! 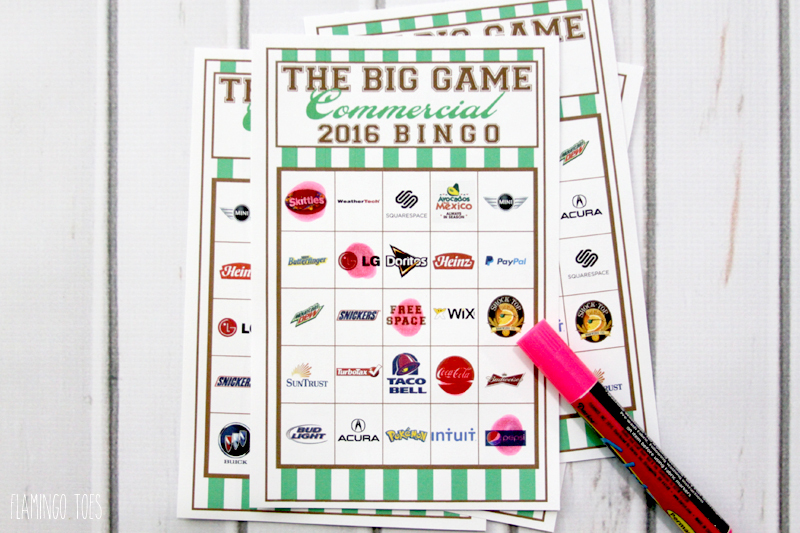 For the past two years I’ve made up a Commercial Bingo and it’s been one of my favorite parts of the game! (Let’s be honest, I’m just there for the food and the commercials). 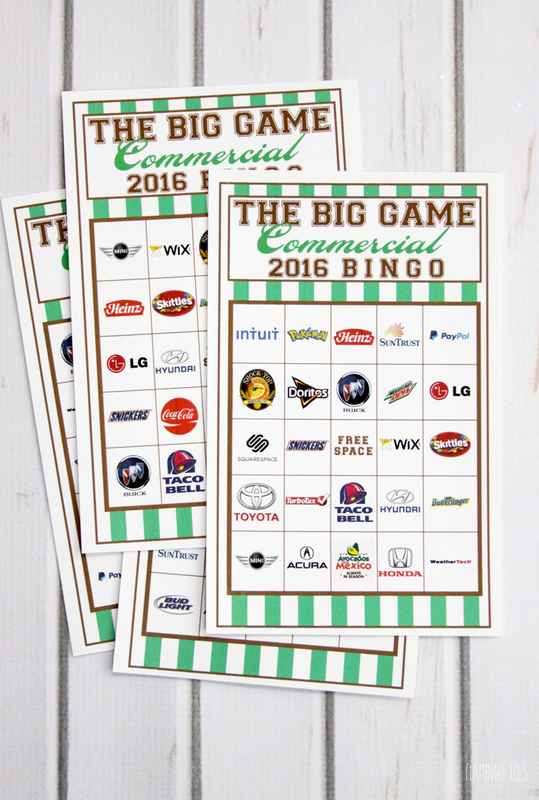 They’ve released this year’s commercials for the game so I’m back with this year’s 2016 Big Game Commercial Bingo! It’s super easy to play, just like regular bingo. You just fill in the squares once each commercial plays, and the first one to form a line wins! I have 8 different cards for you, two per page. So if you have a small party you can do one per person, or if you have a large group you can team up! Oh – and don’t forget the prizes too! The Cards are in PDF format, just click the link and they will open in another window for easy printing. Click Here for the 2018 Commercial Bingo Cards! If you need a cute drink idea, you can check out my easy Football Mason Jars too! I’d love to hear if you play the game! Thank you for printing the Bingo cards again this year! I cannot begin to tell you the fun we had with them last year. We are serious betters; I mean back rubs, foot rubs. We bet ice cream cones at McDonalds last year. I lost so bad; I think it was 11 cones. We have had the best time going to McDonalds and telling “the” story. It is only 6:30 AM in Florida and I have already printed, cut and have them in a folder. Thank you for the updated game cards. to the Dollar Store now for prizes!! Oh my goodness, THANK YOU BEV! I hosted a superbowl party last year and I was at such a loss with what to do for those that are not that into the game. I came across your post and printed out the cards. It was an absolute hit and people had so much fun…. so much that I was asked again to host this year. I came online thinking that I’ll have to find another bingo board or figure something else out but behold, you have continued! I can not thank you enough. Fantastic! You’re awesome! This is such a brilliant idea! I hate football, but I love the commercials! And those football mason jars are seriously adorable. What a fun bingo twist- I love it!!! Love all your ideas. what fun. I am rooting for Carolina in the Superbowl even though i am from Boston! Printing these ASAP! I love this idea!! Great idea!! Just pinned!! 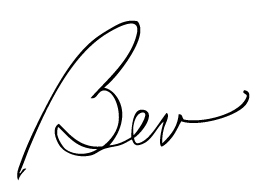 Thanks, Bev!! Thank you so much for the printable Bingo cards. We have never played bingo during the super bowl but I’m sure it will keep the kids and adults occupied during the commercials. Can’t wait until Sunday. Thanks again for sharing all your hard work! Thanks for sharing! What a fun idea. This is such a fun idea! Cannot wait to use them, thanks! Thanks so much for creating these Bingo cards again this year. They are everyone’s favorite part of the day. We purchase 8 different candy bars and as each person scores a bingo they get to pick a candy prize. This bingo makes for a fun day for both kids and adults. I loooove this! My kids would totally want to play this! What a fun idea! Love this. 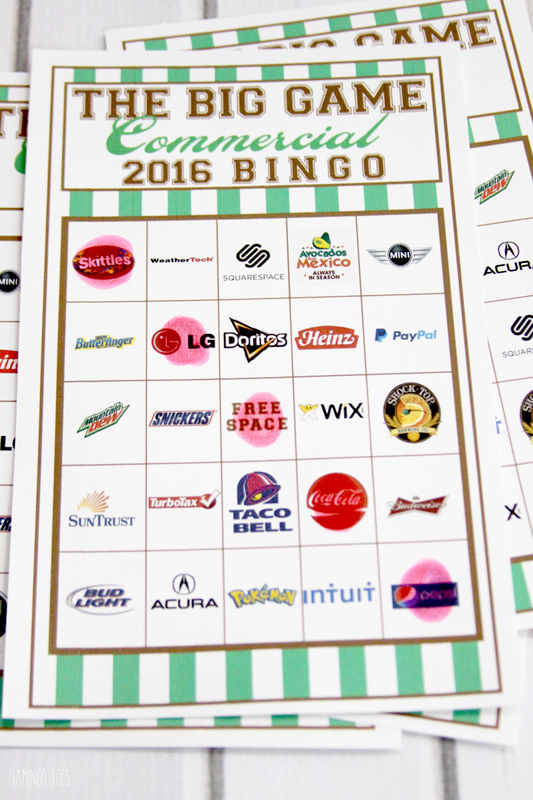 This is the second year i have used your commercial bingo cards ! They’re great ! Thank you ! We will be using again this year! Thanks so much! Thanks for making the cards again this year! We look forward to them for our Super Bowl Party! Does it start after kickoff? How fun! We can’t wait to use these. Thank you so much! This will be my family’s 3rd year of playing your commercial Bingo, and we LOVE it! My 9yo son even said this morning that he is looking forward to playing bingo just as much as watching the game (this from a HUGE football fan). So BRAVO and THANKS for continuing to create this great and FREE printable! Thank you for the download, these are awesome! Thank you so much for doing these again! I used them last year and this year my son said “what about commercial bingo? did you forget?” Apparently he had been looking forward to playing this year! This is the second year we’ve used your bingo cards. They are the best available on the internet. We have more fun playing bingo than anything else at the party. Thank you so much for sharing them. Curious what time people won the first Bingo. Wondering if we must have missed some. We used this – it was fun! Thanks for sharing! I’ll be back for next years! This is just a great idea! I wish I had seen it sooner – but you bet I’ll be watching your blog for next year’s!! It’s the right way for acquiring free deals. Hi will u be putting together a 2017 commercial bingo card? Will you be making one for 2017? We LOVED playing! Yes, I was just wondering the same thing! Please let us know! They will be up on the blog this week Kristen! Thanks for asking! Thanks Jaclyn! Here’s the link to the 2017 cards! http://www.flamingotoes.com/2017/01/2017-big-game-commercial-bingo/ I hope you have a great time with them! hi! I hope you will create new 2017 super bowl commercial bingo cards!! thank you!! so fun!! My friends and I had such a blast with your Bingo Cards for 2016 Super Bowl. Are you going to be making ones for this year’s game? I would love to use yours again. These are so cute and such a fun idea! Will you be making 2017 cards?